Candidates from left to right: Anwar Qarmout, Helen Le Frois, Kevin Elvidge, Michael Tumminelli, Sandra Diglio and Wayne Levante. Photo by Jennifer Jean Miller. 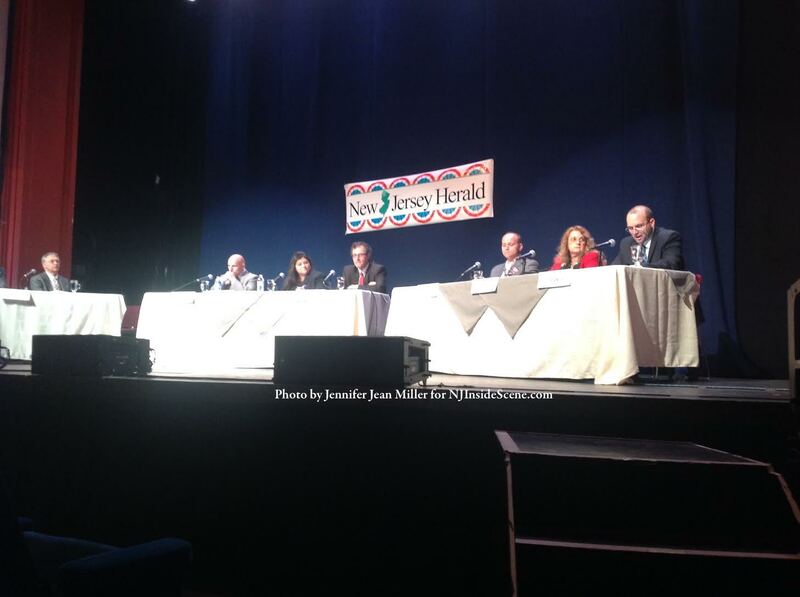 NEWTON – Six Newton residents took to the stage last night at The Newton Theatre for a candidates’ debate, sponsored by The New Jersey Herald. The residents are vying for three council seats up for grabs this election on Tuesday May 13, as the seats for current mayor Joseph Ricciardo, deputy mayor Kevin Elvidge and councilwoman (and former deputy mayor and mayor) Sandra Diglio’s terms end on June 30, 2014. Both Elvidge and Diglio are in the running again, though Ricciardo has decided not to run again after serving on the council since 2001. The debate, which lasted for approximately 90-minutes, was comprised of a question and answer format with the candidates each given a designated period of time to answer the same question and then the opportunity to quickly add on to their responses or provide rebuttals. There was a segment of the program as well when the candidates were given the chance to ask one another a question of their choice and then answer a series of questions with a “yes” or “no” answer. Moderators of the program were Bruce Tomlinson, The New Jersey Herald’s General Manager, and Bruce Scruton, Sussex County Government reporter, who directed questions to the candidates. In addition to Diglio and Elvidge, Helen Le Frois, who had served as a councilwoman until 2012 when she decided to run for a Sussex County Freeholder seat, is in the running again and participated in the debate. Wayne Levante, who had run for council in 2010, has also decided to run again and was a participant. There are two newcomers as well in the race, Michael Tumminelli and Anwar Qarmout. Many of the questions pertained to redevelopment within the town, including particular areas as well as Newton’s position as County Seat. When asked about the special improvement district, all candidates said they embraced it as a “good idea,” with Qarmout answering first that he suggested more dialogue with landlords and Le Frois with business owners. “The question doesn’t have one simple answer,” Elvidge replied, in that the municipality has been working on the project over the last four years. Tumminelli said Newton could not be compared to particular towns where special improvement districts have already worked. “I am in favor of the special improvement district, however, I am waiting to see what the public really wants,” Diglio added, pointing to the public hearing on Monday night at the town council meeting. Levante was concerned too much has already been “pumped” into revitalization of the downtown, without much improvement. Le Frois countered that data showed without a robust downtown the town would not be successful. Levante retracted the use of the word “pumping” and replaced it “wasting,” indicating that more bureaucracy was necessary in the project. Another area of redevelopment discussed was the armory and the state’s involvement with the clean up. Le Frois said the state has already performed a lot of work towards the clean up and it was up to the town next to work with property owners to have the property return to the tax rolls. Elvidge said two months ago the council and town manager met with officials in Trenton and the state admitted to its necessity in helping with clean up to place the property back on the tax rolls and possibly auctioned. Tumminelli likened the clean up to efforts at Fort Monmouth, which he said has been in need of redevelopment for decades. “It is a systematic process,” he explained. Diglio said that the present council is exploring an enzymatic cleaner they have just learned of to assist with the process. “It’s a very delicate matter with the state,” said Qarmout, who suggested letters must continue to be written to the state about the topic. The McGuire Chevrolet area was another redevelopment subject discussed. All candidates were in favor of the idea suggested of a multi-level hotel with indoor parking. “It’s the premier spot in the town deemed for redevelopment,” Elvidge said. In terms of investors, Tumminelli said one must look outside, as well as evaluate where the clientele comes from. Diglio said that with the Holiday Inn Express always booked full, there is a need for additional accommodations and retail. Levante said monies at the Holiday Inn Express are being invested back into Hampton, not Newton and those who would stay at a proposed hotel on the McGuire site could spend the weekend in Newton as well as monies within the area in walking distance. Qarmout suggested mixed-use as well including a place where elderly residents could reside. Le Frois noted senior housing was planned for another area in town and that “this is a really exciting plan,” with parcels slated to connect to Spring Street and creating a walking community. Scruton next asked how the town could attract and keep more business in town. Tumminelli suggested a block to block review and focusing on Route 206, which is the artery that leads everyone into town. Diglio mentioned about the town hiring a marketing coordinator and how efforts were being made to particular properties and Thorlabs has plans to continue to expand its operations within town. Levante said perceptions of the town need to be changed and make others aware of the efforts already made – he also suggested more of a free market with less government intervention. Qarmout suggested more heavy investment into Spring Street and to be more proactive in dealing with absentee landlords. Le Frois said to attract more business and keep it was key and that since the Tax Abatement Plan was enacted in August 2011, no business has taken advantage of the program. She said on Mother’s Day ABC will be coming to Newton to feature it as one of New Jersey’s Five Best Places to visit. “We need to take that and promote it,” Le Frois added. Elvidge said there were different redevelopment areas and concerns about taxes in town and Levante added that while he left Jersey City to come to Newton for lower taxes and a better quality of life, many are leaving Sussex County and Newton for the same reason. How to attract higher paying jobs and for those with disabilities was the next question. Diglio said Thorlabs’ expansion would create another 400 jobs. Levante said he would like to see more entrepreneurs in town. Qarmout suggested capitalizing on the arts and music district to continue to draw opportunities to town. Le Frois named some companies including Meadowbrook, as well as The Newton Theatre and a skateboard company located on Paterson Avenue. She lauded Thorlabs for their efforts and said that she was working to assist a developmentally disabled individual with finding employment in town. Elvidge boasted of the assets the town has, which should be tapped into, including the college, hospital and more. Tumminelli said higher paying jobs in the R&D sector are opportunities the town should seek. Le Frois added that the state has designated Newton as an agri-tourism destination and that should be capitalized on. Accomplishments and disappointments were focused on next. Scruton asked candidates who had served in office what their greatest accomplishments and disappointments were. Elvidge said the revamping of the town’s master plan and vision plan have been great accomplishments. Diglio said the stabilization of taxes was major as well as working together the last four years as a team. Le Frois said that redevelopment, transect zoning, increased bond ratings and shared service agreements were among some accomplishments, however, she wished there were more residents involved and excited about the process. For Qarmout, who said he has been attending council meetings over the last 15 years, and has noticed many accomplishments, said his disappointment has been the council’s inability to say “no,” in terms of spending. Tumminelli did not wish to comment on mistakes as he said all councils have made them and said that he believes the council will continue to grow as residents demand better. Levante said the tax decrease and decrease in crime have been pluses, in spite of the recent arrest of 12 individuals for heroin and prostitution. He said the tax-exempt properties, which he quoted at 35 percent is one concern and he finds the salaries of town officials outrageous. Elvidge countered that actually 29 percent of the properties are tax-exempt. Regarding the fight on drugs and crime, Levante said he would like to see more community involvement and that many residents, especially in the area of where the recent bust took place, were unaware of the police department’s website and text system. “Nothing destroys property value more than a drug problem,” Qarmout added, stating that residents should not tolerate it. “Education is key,” Le Frois said, and spoke of the police department’s task force and work with parents and students, plus the improvements downtown with lighting, cameras and more. “The police department is doing its utmost,” said Elvidge, speaking of the surveillance downtown and more. Tumminelli, who is a program manager in the US Government and has worked on joint task forces, said outside agencies need to be involved. “It affects all of us,” he said. Diglio said parents should become more involved and be proactive. She said the police department has been effective with programs and outreach. Tumminelli said that criminals must know that the town is watching and members of the community must become more involved to deter them. Scruton asked about ideas proposed to involve the college more within the community and asked how. Qarmout suggested a seasonal store on Spring Street, which students from every class could participate with from every discipline. Le Frois, who is on the college foundation board, said that the school would be expanding their offerings to include more offerings with the town. She also talked about the internship program. Elvidge described the internship program as one of the biggest assets in the town and collaboration has been one of the biggest topics of discussion. Tumminelli described the students as “tech based” and suggested STEM as a way to reach them, including bringing a store like Apple downtown. Diglio said a transit system between the college and town is an issue. Levante proposed a culinary program and college run restaurant downtown. When asked what type of feedback the candidates have received in speaking to town residents about what is on their minds, Le Frois said that safety, crime trends and what type of jobs that could come into town were among them. Elvidge said people are proud of the community though there were concerns about vacancies, which he said was changing. Tumminelli said a lack of trust still lingers with the residents and said he feels there is a lack of a connection with the town. Diglio said taxes and crime have been some of the issues, as well as people’s perceptions. For Levante, it has been salaries (which he said he would not be taking if elected), the disconnection between the town and school board and working on redundancies. Qarmout said it is vacancies in town, disconnection people feel from the town and taxes. Le Frois countered Levante and said that he had suggested twice he would not take a salary and that he must still receive one. Elvidge advised council members receive $2,400 a year plus an additional $500 as mayor. Elvidge said that Diglio’s husband Philip donated his salary to one of the youth athletic organizations in town when he served. “The point is, I’m not taking a salary,” Levante fired back, noting that new members of the council also could not receive benefits, so there was an increase in cost for those grandfathered under the benefits plan. During the Q&A portion some of the debate grew fiery between particular candidates, including Levante asking Le Frois about contact negotiations with a police department employee signed while she was mayor, between Le Frois and Qarmout when she questioned property tax relief for his brother’s home when it caught fire and Qarmout asked the council to make a temporary exception while the family recovered and was denied and Qarmout, in turn, asking Le Frois about running again after leaving office to run for freeholder. The full debate is available on The New Jersey herald website and via Service Electric Cable TV. 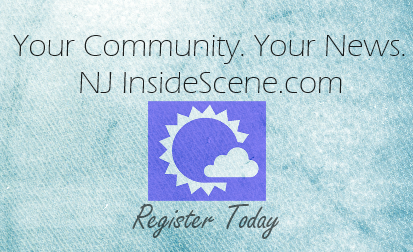 Stay on the Inside Scene and follow us here on Facebook!